IN the season two finale of Ghost Hunters International, the team are Costa Rica bound as they arrive at the base of the still active Irazu Volcano to investigate an abandoned hospital which went on to become a sanatorium run by Dr. Carlos Duran. The Duran Sanatorium has had many purposes, first a hospital for tuberculosis and leprosy and later an insane asylum and even an orphange. Although the building has been abandoned since 1973 because of the eruption of Irazu, people have seen spirits of the past that many believe still persist to this day. The GHI crew then heads to Kingston, Jamaica and try to shed light on the ghost of sugar plantation owner Annie Palmer. Her cruel and sadistic ways towards her slaves labeled her as the "White Witch Of Rose Hall." With underground dungeons, torture chambers and a mansion of hell, Ms. Palmer was known to practice witchcraft and voodoo in the hopes of gaining additional power over her servants and increasing her riches. Rumor has it that she was responsible for the deaths of her three husbands and countless number of slaves. Visitors and tourists to Rose Hall have said that they have heard hurried footsteps, crying babies, disembodied voices and music from long ago. The Legend of Rose Hall airs Wednesday, February 17th @ 9:00 p.m. EST on The Syfy Channel. 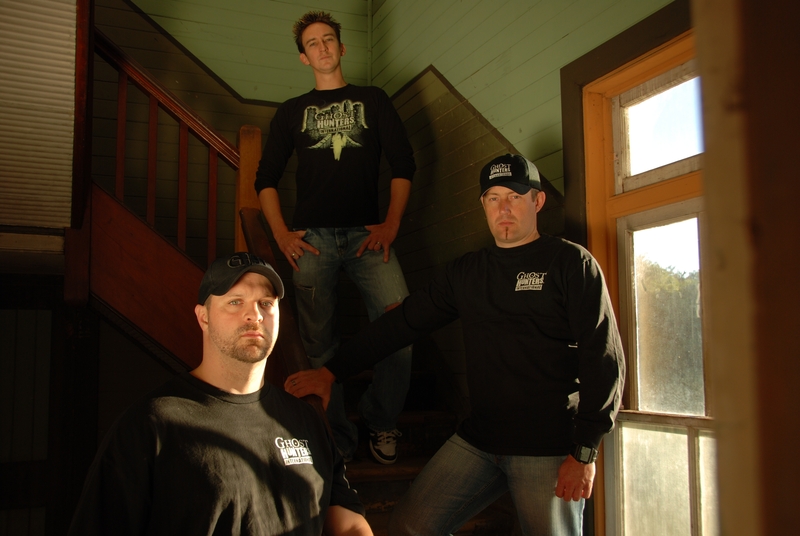 Ghost Hunters International team members (L-R) Robb Demarest (lead investigator), Dustin Pari (investigator) and Barry FitzGerald (investigator/tech manager). Photo copyright of the Syfy Channel. From the coast of New England, to the Deep South and even the glamorous world of Hollywood, every corner of the United States has its fair share of ghost stories. There are, however, other countries all over the world where equally as compelling, and in some cases even more terrifying, tales of the paranormal have been documented. Since early 2008, the Syfy Channel's Ghost Hunter International team has travelled the globe to check out such claims and separate fact from fiction. This past January, the latter half of the show's second season began airing, with GHI trekking to Miramar, Argentina and the Gran Hotel Viena, the one-time secret residence of many Nazi war criminals, including, it is rumored, the infamous Adolf Hitler. Among those heading up this investigation was GHI team member and technical manager Barry FitzGerald, who looked forward to returning to that country. "My only time previously in Argentina was to fly through the country in order to change airports," he says, "so this was a great opportunity for me to go back there and really meet the people and see the country. However, when we arrived at the place I certainly wasn't expecting to find half the town ruined by a giant flood. "That meant there weren't hotels per say that we could stay in, so we wound up sharing houses. [Fellow investigators] Dustin Pari, Joe Chin and I stayed in one house and shared the cooking along with everything else. It was a remarkable experience for us to bond in that way, not to mention looking out the window and seeing Hitler's villa across the water. It was truly memorable, never mind, of course, finally getting to the actual location and seeing it in its raw. "We also shot the Silver Shadow episode in [La Falda] Argentina, where great minds such as Albert Einstein had come to The Eden Hotel. To be on the steps where he once stood was wonderful, as was the chance to investigate the hotel. Such places were quite ornate in their time, and to see what this one had fallen into now, and in such a short period of time, was very disturbing in its own way. To be able to go in there, though, and film was truly remarkable, and Dustin's efforts to reach the spirit of the little boy was an especially memorable experience for him as well." Following their time in Argentina, the GHI team journeyed down under to Australia for a pair of investigations, the first being in Sydney where they visited the country's most haunted place, Quarantine Station. From 1828 to 1984, migrant ship passengers suspected of having infectious diseases were diverted to this facility for an average quarantine period of 40 days. For some, the conditions there were not conducive to their recovery, which could help explain the reported appearances of various troubled souls. Considerably more inhospitable was Port Arthur, nicknamed "hell on Earth," where 19th century convicts lived and died. "Australia itself presented some interesting problems, mainly because of the wildlife," notes FitzGerald. "From what we've been led to believe, Australia is home to one of the deadliest spiders known to man. Obviously, we're in locations where these things can hide anywhere, so at any minute you're not quite sure what to expect. And that carries through into Costa Rica and the later episodes this season. It's bad enough being worried about ghosts, but when you have to start worrying about the wildlife as well, that really does add another element to it. Don't get me wrong, it's extremely fascinating, but an Irishman like me has no idea how to deal with crocodiles," he says with a chuckle. "At one point at Quarantine Station we were trying to get into one of the [medical] units that the nurses had used, but the door was locked. We had to call security and have them come down to unlock it, so while we were waiting for them I continued to take pictures. My IR [infrared] light was switched off - in fact, everything was switched off and I was just shooting in the dark so to speak. That's when the young lad standing by the fence appeared in one of the photographs. To see something like that in detail, because we have the raw image to examine, was outstanding, and it contributed in a major way to explaining some of the theories relating to research I was doing back in Europe. So I was thrilled to capture the image of that young lad. "With Port Arthur, the photograph of the guy walking in front of the church is something I wasn't expecting and certainly defies science as it stands. I cannot duplicate it. I simply don't understand why this happened or how it happened. The camera did not malfunction; everything was working perfectly and on about a 30-second exposure. There should have been some trace of that guy moving, but there wasn't. He just seemed to suddenly appear and disappear in the same spot, and it was unbelievable. "Right now, we are standing on the edge of a precipice where no one else has stood before. With the advancement of technology, we're starting to see things that we never previously thought possible, and to say that there are no such things as ghosts just because we often can't see them, doesn't apply any more." In last week's episode, Tasmania Death Sentence, the GHI crew cast an investigative eye over the Tasmania Supreme Courthouse in Hobart, Tasmania and the unexplained activities that have occurred there. "Tasmania is an island almost carved out of the same rock as Australia," explains FitzGerald, "so I have to say that some of the experiences we had there were very similar to the Australian mainland. But to learn about the history of Tasmania and what happened to the natives on the island with regard to the intervention of Western ideals was a big eye-opener for me, Dustin and Joe along with some of the other guys." "As far as Costa Rica, well, my word, I have never seen wildlife quite like it. And I have to say I've never been anywhere else in the world where I have been taken aback so much that I stopped what I was doing for an hour to witness a feat of nature," enthuses FitzGerald. "To watch the sea light up at night with the algae was inspiring, and irritating at the same time. I was using my full-spectrum camera, with which I can take photographs of stars millions and millions of miles away, but yet when I tried to photograph the phosphorescence on the water, it evaded me. I just couldn't get it, and then I realized that this was not for anyone else. It was just for me. So I stood there and watched as hammerhead sharks, barracuda and these other big fish lit up the water as they swam through it [the algae]. It was awe-inspiring. "Then, of course, there was the whole thing of being caught on the island in the middle of a very severe thunderstorm, and realizing we were trapped there and simply could not leave. To top it off, everything on the island was trying to get a piece of GHI if you will. This particular investigation is the one that really stood out for me this season. We really pushed the boat out with that one, so to speak, because of the hauntings as well as seeing the beauty of nature, both in daylight and at night. It's a really interesting episode and I look forward to hearing some of the feedback on this specific case because I can't see the show here in Europe." The other case in GHI's season two finale, The Legend of Rose Hall, unfolds in Kingston, Jamaica, where our investigators delve into the history of sugar plantation owner Annie Palmer. Nicknamed by her slaves as the "White Witch of Rose Hall," it is rumored that Annie was responsible for the deaths of three husbands as well as countless slaves. "Jamaica was another place that opened our eyes to what has gone on with Western intervention," says FitzGerald. "The cruelty there was very prominent in this particular case and the results of it, and I hope that viewers will understand that. We shall see what comes of it. Again, I'll just have to fall back on feedback after this episode airs." Having first worked with Jason Hawes, Grant Wilson and their team on the original Ghost Hunters, FitzGerald along with former GHI investigator Dustin Pari returned to the GH fold to assist them with their 100th investigation, which will air in March. "Alcatraz is something that you usually see form the air," says FitzGerald, "or if you're visiting San Francisco and have the time, you can always nip across on the ferry and get a quick tour from some of the wonderful guides on the island. It is, however, a very rare opportunity, indeed, to get onto the island at night and investigate. It was incredible to be there and understand that the Birdman of Alcatraz had once been there and some of the big Mafia names as well. To then stand in their cells was just beyond words, and the [paranormal] experiences there were amazing, too." Last summer, FitzGerald and Pari saw the publication of their first book, The Complete Approach - The Scientific and Metaphysical Guide, which gives readers a greater insight into the subject of paranormal investigation. "We received tremendous feedback on the book and people have loved it," says FitzGerald. "There was a great deal of work put into it, so much so that Dustin and I are preparing to put out another one, hopefully at the end of March. We've been working very diligently on this second book, which is called So My Home is Haunted, Now What? It's a collection of thoughts and different ideas about what other cultures, belief systems and religions do to fix this particular problem. "Like a lot of [paranormal] investigators, we come into a house or other building with a TV crew and give the people living or working there proof of ghosts in a photograph or recording of the ghost's voice. We then leave and these individuals are left holding the candle and wondering, 'What do we do now?' So this book gives possible solutions to a problem that has plagued a lot of people around the world. It's a wonderful read and one that we believe is also educational at the same time. So we're looking forward to its release." Besides this forthcoming book, FitzGerald is also working on a variety of other projects as he waits for production to begin on season three of GHI, "There's a third book following behind this second one, and I'm trying to open a gallery in Vienna, Austria as well," he says. "So there's quite a bit going on, and time not being in great abundance can severely hinder your plans. I fly back and forth through Europe and I now find myself residing more in Austria than I do back in Ireland. "When it comes to GHI, I'm not sure yet where we're headed next, but wherever we go, I'm sure it will turn out to be fantastic and certainly bring a lot more things to the forefront for viewers back home." [caption id="attachment_3367" align="aligncenter" width="300" caption="Legendary rocker Meatloaf (third in from left) joins Grant Wilson and Jason Hawes along with the rest of their team on this week's Ghost Hunters. Photo copyright of The Syfy Channel"] [/caption] MUSICAL legend and diehard Ghost Hunters fan Meatloaf accompanies the TAPS team on an investigation at one of the finalist locales from last year's "Great American Ghost Hunt" search, a haunted private island in Thousand Islands, New York. Stretching over four acres, the island boasts a towering 10-bedroom mansion and boathouse. The area was formerly part of the Underground Railroad and was also used as a monastery. The Claudia family has owned the premises for the past 50 years; however, they may not be the only ones inhabiting the island. Floating heads, phantom music and glowing figures have scared the Claudias and their houseguests senseless. It's up to the Ghost Hunters to flush out the spooks and stop them from disturbing the peace. Will the team solve the riddle of America's most haunted island? A Bat Out of Hell airs Wednesday, September 30th @ 9 p.m. EST on The Syfy Channel. Click on the following link to view a preview clip from this episode - https://rcpt.yousendit.com/745440603/6683eb6524bc6360b9ad042ce98c30c5 As noted above, the photo is courtesy of and copyright of The Syfy Channel, so please no unauthorized copying or duplicating of any kind. Thanks!